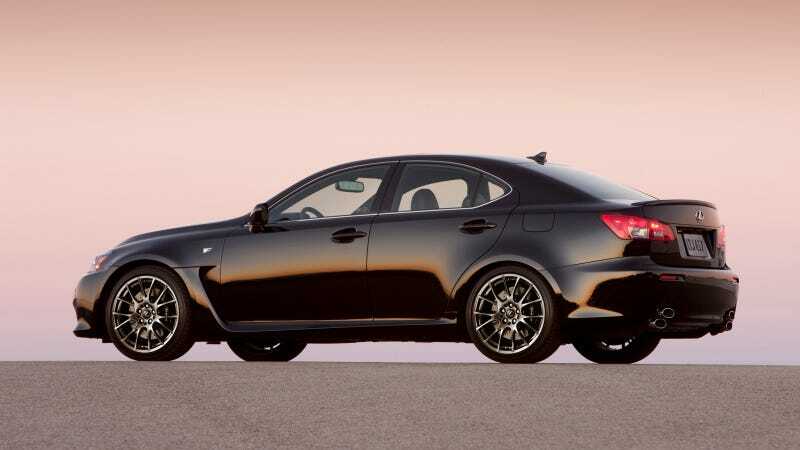 The 2014 Lexus IS F delivers a 416-horsepower wallop on road or track, handling both driving environments with equal aplomb. While bristling with track-focused engine and chassis performance technology, the 2014 IS F also remains comfortable and practical to drive every day, a true dual-purpose machine. When it arrived for model year 2008, the IS F not only shook up the status quo among high-performance sport sedans, but also foreshadowed the brand’s LFA supercar, which recentlycompleted a 500-unit run. The same passion for performance continues to define the IS F, which for 2014 remainson a thoroughly optimized version of the 2nd-generation IS platform. The IS F gains interior and trim changes in its seventh year. The Lexus IS F combines blistering acceleration with brilliantly controlled chassis performance, yielding a highly satisfying machine for driving enthusiasts of all skill levels. The muscular rumble issued by the low-restriction dual-exhaust system, which terminates in distinctive stacked quad diffusers, announces the presence of a special high-performance version of the Lexus 5.0-liter V8. Engineered specifically for the IS F, the aluminum V8 emphasizes both high output and high durability. The engine produces a rousing 416 horsepower at 6,600 rpm and 371 lb.-ft. of peak torque at 5,200 rpm. While able to provide an instant rush of power and sustain high engine speeds for track driving, the 5.0-liter V8 remains utterly composed and refined in everyday driving. The eight-speed Sport Direct-Shift automatic transmission proves a willing partner on road or track. For maximum performance, the driver can shift manually with steering wheel paddle shifters in either “D” or “M” modes, but in “M” mode, the transmission will hold each gear to the 6,800-rpm redline and execute ultra-quick shifts in one-tenth of a second. In “M” mode, the transmission “blips” the throttle to match engine rpm to vehicle speed, which helps maintain traction and control, especially when slowing through curves. Selecting Normal, Sport or Snow driving modes alters the car’s dynamic control systems to sharpen performance or increase comfort and traction. The driver faces a gauge cluster with a large central tachometer, similar to that in the LFA supercar. In order to perfect the IS F’s road/track dual persona, Lexus conducted IS F development work not only at Germany’s renowned Nürburgring Nordschleife racetrack, but also at Circuit Paul Ricard in France and Fuji Speedway and the Higashi-Fuji Technical Center in Japan. The shape of Turn 1 at Fuji, in fact, inspired the car’s “F” badge design as homage to its home track. Numerous track-proven modifications to the double-wishbone front suspension and multi-link rear suspension configurations endow the IS F with uncanny ability through curves while maintaining refined rode comfort. Special rear control arms, high-rate springs, monotube dampers and large-diameter stabilizer bars are among the changes made to this platform for the IS F.
As part of the IS F development program, Lexus worked with Michelin and Bridgestone to develop tires specifically for the car’s 170-mph track capability. The “staggered” wheels and tires follow racecar convention, with wider, lower profile tires on the rear. (The front wheels are 19 x 8.5-inch, with 225/40R19 tires and 19 x 9.5-inch in the rear, with 255/35R19 tires.) You’ll find Brembo® brakes on the world’s best high-performance cars, including, of course, the Lexus IS F. In front, rigid, powerful six-piston aluminum calipers grip 14.2-inch ventilated and drilled rotors, while the 13.6-inch ventilated, drilled rear rotors use two-piston calipers. A Torsen® rear differential helps provide additional traction in spirited driving. The IS F deftly integrates an array of advanced chassis control systems to help maximize braking and traction performance in the IS F. Specifically, engineers calibrated the brand’s Vehicle Dynamics Integrated Management (VDIM) system to support the car’s high dynamic capabilities. By integrating the car’s dynamic systems, and by combining input from a variety of sensors, VDIM doesn’t merely react to hazardous handling situations but rather can anticipate the onset of a vehicle skid or slide. The system can help correct the situation with a combination of braking, steering and throttle control. How does it all work in performance driving? Seamlessly. Push the Lexus IS F aggressively through a corner, and VDIM helps prevent the inside rear wheel from spinning, transferring more power to the outside wheel to help maintain traction and momentum. In Sport mode, VDIM increases steering feel and allows higher dynamic thresholds before intervening with confidence. As if the IS F’s bellowing exhaust note weren’t enough to express the car’s presence, the car’s wide-body design also does much to convey the high-performance capability. The widened fenders were needed to clear the 19-inch low-profile tires, and other body modifications combine function with form, as well. The raised center section in the hood clears the big V8. Air management for engine and brake cooling can be seen in large upper and lower mesh-type grilles, along with brake cooling ducts in the lower grille and air outlets in the front fenders, where you’ll also spot the discrete silver, black and blue F badge. The interior of the IS F features an exclusive design treatment highlighted by aluminized composite trim, striking two-tone upholstery, main gauges, unique steering-wheel design and other special surface treatments. The “F” logo is discretely showcased on the steering wheel, rear-center console and all seat headrests. Scavenge pump ensures a reliable oil supply even during cornering that exceeds 1 g.
Variable Valve Timing with intelligence by an electric motor (VVT-iE) to expand VVT operational range to lower engine speeds. Lexus stands at the forefront of in-car multi-media systems, and that certainly holds true for the high-performance IS F. When equipped with the navigation option, the IS F also features Lexus Enform®. The available Enform service, with Destination Assist, eDestination, and App Suite, comes with the Navigation System/Mark Levinson Audio Package. Lexus Enform provides access to the subscription-free App Suite. These voice-enabled apps let you search the Internet through Bing™, make restaurant reservations through OpenTable®, get movie tickets via MovieTickets.com™, listen to Internet radio, including , Pandora®, and iHeartRadio™, search business reviews on Yelp®, and check in on Facebook Places™. The IS F’s telematics system, Lexus Enformwith Safety Connect® is available by subscription. Complimentary one-year trial subscriptions are available on all purchases of new Lexus vehicles equipped with these features. Safety Connect is standard on all vehicles while Lexus Enform with Safety Connect is on all vehicles equipped with the optional Navigation system. The Lexus Enform and the Safety Connect response centers operate 24 hours a day, 7 days a week—every day of the year. Passive-safety technology in the IS F begins with a reinforced passenger compartment that helps protect the occupants with front-and-rear crush structures. The available Pre-Collision System (PCS) can help reduce collision damage. The package includes Dynamic Radar Cruise Control, which uses millimeter-wave radar to measure and maintain a pre-set distance from a vehicle traveling ahead. PCS relies on the radar sensor to detect obstacles in front of the car. The PCS computer, taking sensor inputs from vehicle speed, steering angle and yaw rate, is designed to determine whether a collision is unavoidable. In such a situation, PCS preemptively retracts front seat belts and pre-initializes Brake Assist so that increased braking will be applied the instant the driver depresses the pedal. The IS F interior features specially shaped and trimmed seats that help position the driver comfortably and securely. The standard SmartAccess keyless entry and push-button start allow the driver to keep the access fob in a pocket or purse. Standard amenities include 10-way power front seats; dual-zone automatic climate control, a pollen filter and smog detector; power moonroof with one-touch open/close and seven open-position settings; power tilt-and-telescoping steering wheel; three-position memory function for front seats, steering wheel and mirrors; all power windows with automatic up/down operation and jam protection; an auto-dimming rear-view mirror with a HomeLink® programmable garage door opener; automated rain-sensing wipers and heated auto-dimming outside mirrors with integrated puddle lamps. The standard Lexus Premium Audio System features a six-disc, in-dash CD changer, 13 speakers, USB/iPod®connectivity, streaming audio via Bluetooth® and an integrated SirusXM Satellite Radio receiver (complimentary 90-day trial subscription included). Lexus Enform 2.0 with App Suite on navigation equipped vehicles. Available Bluetooth automatic phonebook download capabilities. Available HD Radio™ with iTunes tagging. The IS F offers a 14-speaker Mark Levinson® Premium Surround Sound Audio System with discrete 5.1 multi-channel playback, 7.1-channel speaker architecture, and 10 amplifier channels providing 300 watts total output at less than 0.1 percent total harmonic distortion from 20 to 20,000 Hz (THD all channels driven). The available Intuitive Park Assist (IPA) system uses ultrasonic sensors to detect objects close to the car's front and rear bumpers, alerting the driver and showing distance to objects in the multi-information display within the speedometer. The optional Lexus Navigation system features Voice Command casual-language voice recognition, Bluetooth automatic phonebook download, and HD Radio with iTunes tagging.